I have recently had the pleasure of making the aquaintance of Chris, a parishioner at St. Josaphat Church in Detroit who does a lot of computer and public relations work for the parish and for the Detroit Latin Mass community , which consists of parishioners of the Sweetest Heart of Mary and St. Jospaphat cluster. 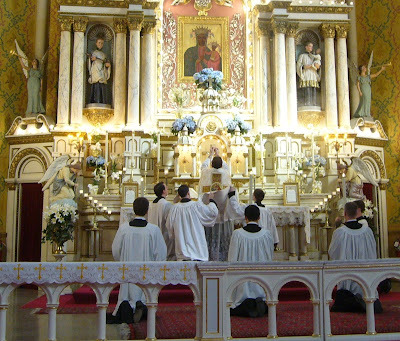 St. Josaphat was one of the indult parishes that offered the TLM prior to Summorum Pontificum; indeed, before SP, St. Josaphat was the only parish in the Archdiocese of Detroit that offered the TLM. Chris has conceded to being interviewed regarding the changes in his parish and in interest in the TLM in Detroit since SP (all the pics on this post are of St. Josphat as well). Please describe what you do for the Latin Mass community in Detroit. I keep the website updated, respond to emails, and send updates to people on the email list. What first attracted you to the Traditional Mass? I did not have a missal at the first few masses I attended, but the posture, the architecture, the music, all worked together, it was all very coherent and directed to God. What is the make-up (age, where people are from, etc) of the Latin Mass Community in Detroit? At St. Josaphat people come from all over the archdiocese and beyond, each week people come from the Ann Arbor area, and Windsor [Canada]. We have people of all ages attending; I’m not sure what the average is but I would guess it is younger then the average parish. People who attend for the first time usually mention the large number of young adults and children. Have you seen an increase in attendance of the TLM since Summorum Pontificum? It increased in the time between the announcement and the implementation, when other churches started we went back to the level we were at before and now have about the same attendance we had a year ago. Have you received an increase of requests for information or inquiries about the TLM since SP? The emails that I receive have increased, traffic to the website, and views on youtube have gone up quite a bit. In one of our columns shortly after SP it was stated that 17 local priests have expressed an interest in learning the TLM, that number has since grown to 30 that either have begun, or have interest in celebrating the TLM. Has the TLM been spreading in your area since SP? Can you list any specific new Masses or parishes offering the TLM? There are seven parishes in the Archdiocese that have offered it since SP: St. Josaphat, St. Joseph – Detroit, Assumption Grotto, St. Stephen, SS. Cyril and Methodius, Sacred Heart – Yale, Sweetest Heart of Mary, and St. Albertus (which no longer functions as a parish) has also had a TLM and more are now scheduled, and Our Lady of Mount Carmel in Wyandotte will begin a regular TLM in June. Prior to SP we were the only one in the archdiocese. How has SP affected your parish? Has it had a lot of influence, or have things pretty much stayed the same? There is now a Monday evening mass, and the opportunity to celebrate other sacraments using the EF, baptisms have been administered using the EF, confession will begin soon, and there are weddings scheduled. We’ve always been in a good situation though, we have always had the 9:30 AM time slot. 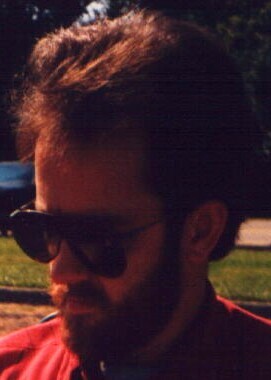 Our Pastor, Fr. Borkowski, has had many improvements made to the church, including upgrading the communion rail and high pulpit, and the addition of an altar rail linen all of which are used at the TLM and were done prior to SP. Why do you think young people who never grew up with the TLM are attracted to it? The most commonly mentioned reasons are the reverence, the music, the time-tested elements, the stability and the beauty of it. Has your Ordinary (Cardinal Maida) responded to the TLM? Enthusiastic? Foot-dragging? Outright opposition? Hasn't said anything? Very early on he issued a supportive statement, it is still posted on the AOD website and we have a link to it on http://www.detroitlatinmass.org/. Several of the Auxiliary Bishops have celebrated the TLM at St. Josaphat. Bishop Boyea, now the Ordinary in Lansing would celebrate about once every quarter. What do you think will be the long-term effects of SP on the life of the Church, both universally and locally? Pope Benedict has spoken and written about a perceived rupture between a pre-conciliar Church and a post-conciliar Church. I think long term SP will be a part of the interior reconciliation in the heart of the Church that the Pope cited as a motivation for SP. 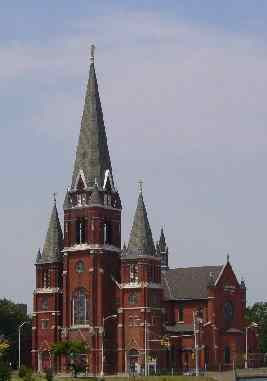 I am one of those who drives from Ann Arbor to St Josaphat. In fact I am a registered parishioner. But remember, it is not just the TLM itself, but the priest(s) that are an integral part of making the TLM the wonderful Mass it is. Unlike some I have experienced in the Novus ordo who will lie to people for self gain and self attention, the priest must be true to the Faith and supportive beyond the ordinary expectations. I experienced this with the priest whom I served as a young man and Fr Mark B is one of those priests. I have met Bishop Boyea and attended a Mass he celebrated at St Josaphat. He is a wonderful Ordinary with the reverence and dedication to the Mass beyond expectation. I hope and pray that here in the Lansing Diocese, Bishop Boyea will be able to establish the TLM in the Ann Arbor area in a church as beautiful as St Josaphat. TLM will vanish from there. I have heard much about the Northwest corner of our country and it is, even with those who fight for the TLM and all of the traditions, are faced with opposition from the diocese. Pray for those out there. Together with the traditionalists there we can reestablish what was lost. Don't forget St. Joseph: my parish: that was left out of your mention of the cluster, with the other two churches. Fr. Borkowski is my pastor, and is in charge of all three. I attended a TLM at St. Joseph two Sundays ago and we also attend Assumption Grotto on occasion. 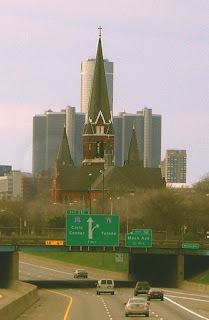 These are all the most traditional churches in Detroit. I also think St. Joseph is the most beautiful church building in Detroit (no bias here! ), with wood carvings and stained glass imported from Germany. Gorgeous . . .